The 10 Best Steakhouses in Iowa! Whether you take your steaks rare, medium, or well-done, you’ll find a finely-raised cut of meat in Iowa—home to some of the best beef in the country. Throughout the Hawkeye State you can find steakhouses that range from casual eateries to fine dining experiences. Here are the 10 best in Iowa. Featuring farm-to-table entree options, the Iowa Chop House located in the historic downtown district of Iowa City, is a fresh-fare steakhouse and eatery that should be on the top of your list. With a menu that rotates according to the season, the Iowa Chop House is the perfect restaurant to celebrate a special occasion or just a great meal. While you are there and after you visit, the downtown district and pedestrian mall of Iowa City is a fun place to explore and a fitting location to walk off your meal. Featuring dry aged beef and special attention to fresh ingredients, the community and people agree, Archie’s Waeside in Le Mars is one of the best steakhouses in Iowa. With an affordable entree selection, Archie’s does serve up other specialty items including grilled pork loins, but it’s the steaks at Archie’s that puts them on the map. Check out this Le Mars favorite for yourself, and see why one steak from Archie’s will never be enough. The original 801 Chophouse was established in Des Moines in 1993, and since then has spread out to six different location across the Midwest, with every spot under the 801-umbrella defining what it means to be a premier steakhouse. Suited for a special occasion or private event, the 801 Chophouse is fine dining at its best, and outside the wide selection of steak and side options, it’s the classy interior and attention to service at this Des Moines staple that makes 801 Chophouse one of the best steakhouses in the nation. Whether you are looking for some of the best meats in Iowa, or the most savory sides, then the Big Steer in Altoona should be on top of your list. Featuring an overflowing menu of delectable Midwest entrees including giant pork tenderloins, charbroiled pork chops and of course, juicy steaks, the Big Steer has something for everyone to enjoy and leave satisfied. Whether you order it rare, medium or well-done, you’ll be sure to get exactly what you’re looking for from the Big Steer in Altoona. Not only can you enjoy a quality cut of beef at the comfortable confines of Rube’s Steakhouse, but with their online ordering system, you can grill that same cut of beef on your own grilling system at home. Rube’s Steakhouse is worth stopping into and enjoying a meal, and the aromas alone can entice you to stay awhile. With daily specials each week, like all-you-can eat kabobs on Thursdays, plus some of the most cared for meats in the state of Iowa, now is the time to put Rube’s Steakhouse of Waukee on your list of restaurants to check out soon. With excellent outdoor recreation surrounding the town of Albia where Bogie’s Steakhouse is located, such as turkey and deer hunting seasons plus fishing all year round, Bogie’s has proved to be a great meeting spot for sportspeople of all kinds. While the burgers and other traditional menu options at Bogies are worth the visit, it’s their steaks that bring people back for more, and whether you just finished a big hunt or are looking for a quality meal, Bogie’s Steakhouse is serving up just what you’re looking for. Since 2001, Mo Brady’s on Brady Street in Davenport has focused their menu and beverage options close to the serving room. All the steak and delicious entree options found on the menu at Mo Brady’s comes from Iowa-raised Angus beef, and the beers on tap are all brewed in the Quad Cities. What this means for you and the many consumers who call Mo Brady’s their favorite is that the food is fresh, the beer has traveled just a few miles to make it into your glass, and the good times are guaranteed. Locally owned and operated, the Northwestern Steakhouse in Mason City has been a staple steakhouse not only in the community it’s surrounded by, but in the entire state of Iowa. 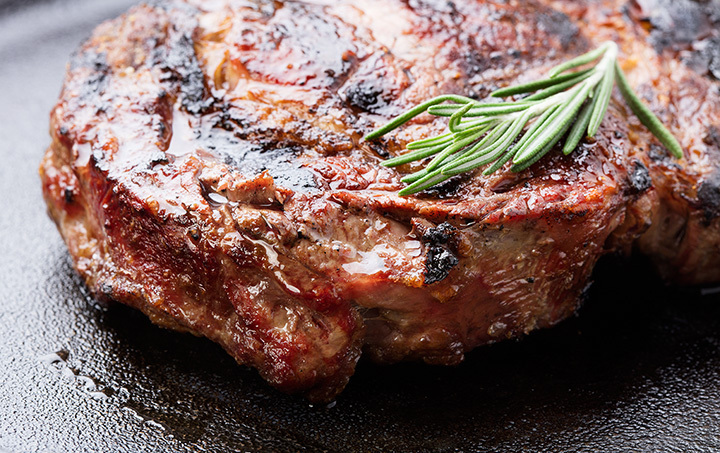 Each cut of steak at Northwestern Steakhouse is grilled to perfection with a combination of olive oil, butter and a special sprinkling of Greek seasoning, making each bite melt into your mouth. If for some reason, you are not feeling steak with your next visit to Northwestern Steakhouse, their selection of roasted chicken, broiled shrimp, fresh seafood and lamb chops provide some A+ alternatives. You know the one we’re talking about, it’s That Place in Conrad, always serving up the freshest food and award-winning sides. That Place is a casual spot in Conrad, and while the environment is fairly laid back and welcoming, the food on their menu is far from basic. Whether you are looking for a classic dinner option like a burger with fries, or you’re treating yourself to a specialty prepared steak, That Place has just what you’re looking for at a friendly price. Featuring upscale dining in small town Iowa, the White House Supper Club specializes in steak and seafood, although every entree item found on their menu is worth the visit. Whether you are celebrating a special occasion or are just looking for someone else to do the cooking, the White House Supper Club in Saint Lucas is more than just a meal, it’s an experience, and with a finely prepared steak at the center of it all, it’s an experience that will leave you very satisfied.